As the cold weather has come (and is now staying! ), my patients have a whole new wardrobe - for their feet, that is. Now that snow is on the ground, everyone has pulled their boots out of the closet. 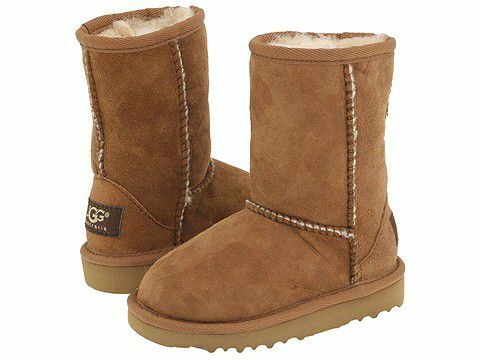 The most common boots I see in the teenage crowd are Ugg boots, or a similar Sherpa boot. But beware of the type of boots you choose, because it can have an affect on your feet! Ugg boots are soft inside, but they are also very flat. When you wear a boot that is very flat, your foot has no support in the heel or in the arch. Prolonged wearing can cause arch or heel pain. Very often I urge my patients to wear their orthotics in their boots to give them the support they need. These boots are also marketed to be worn without socks due to their furry lining. But beware of this! Without a protective layer of socks, there is more potentil for your feet to sweat (yes, even in cold weather!) and moisture gets trapped between your toes. This is a perfect environment for fungus to grow, and appear either as athlete's foot between your toes or settle into your nails and cause fungal nails. Regardless, with taking some simple steps, you can wear those Ugg type boots and still keep your feet healthy. If you have any problems however, do not hesitate to call our office for an appointment 630-834-3668. You will be glad you did!